Extraordinary sculpture art requires two things: unbridled imagination and superlative skill. It should be no surprise then that some of the most astonishing contemporary sculpture is being made in Japan, which has no shortage of either! Perhaps the greatest advantage Japanese sculpture artists have over their international counterparts is the rich history of craft mastery that they can draw on. Whether working in metal, wood, bamboo, or ceramics, today’s innovators can apply centuries old techniques to the most intriguing new ideas. Here we have selected 7 Japanese artists who do just this, resulting in some incredible art sculptures that you won’t be able to forget! Japanese ancient folklore is a mystical world of monsters, ghosts and goblins. Sculpture artist Ryo Arai reveals its dark secrets with his surprisingly lifelike characters. This seductive spider woman is named Jorogumo, a type of ghost or goblin that was a well-known figure in Edo fables. Legend has it that this creature would first appear as a beautiful woman to entice her victim by playing biwa, a Japanese flute, and would then bind him in a spider web to be her next feast. This stunning representation is part of the Yokai Hariko series, where Arai traces monstrous figures from the Edo period. He combines woodblock-engraving techniques with traditional netsuke carving – a specialized workmanship for miniature sculptures first developed in the 17th century. Arai has a great blog in Japanese detailing many of his mythological creations at h-box.info/arairyo_site. Only in Japan could a hermit crab find such luxurious accommodation! Of course, this crab is not a living creature, but is ingeniously constructed from wood. This beautifully naturalistic sculpture was created for an exhibition showcasing the how different craft traditions can be fused together. The elegant shell is pieced together from a pair of lacquer bowls. An octopus design is raised from the surface of the bowls using a technique called takamaki-e, where layers of lacquer, charcoal and metal powder are built up to form a three-dimensional motif on the otherwise smooth lacquer. Lacquer artist Takashi Wakamiya leads a team of artisans, Hikoju Makie, who work together employing traditional Japanese craft techniques to produce exquisitely desirable objects such as this one. Find out more at wakamiya-takashi.com. At first glance, this looks like a sculpture expertly carved from a wooden block, but look closer. In fact, Nagato Iwasaki’s perfectly proportional creations are assembled from pieces of driftwood that the artist finds on the beach near his studio in Yamanashi. The weather-worn curves of the wood are carefully placed to reflect the curves of the human form. Iwasaki achieves this without any recourse to nails or glue – all the pieces are held together by wooden stakes. For more fascinating sculptures from Iwasaki, visit his website at nagato-iwasaki.com. The artistry of Masao Ueno’s abstract bamboo sculptures is made possible only by a weaving together of many skills: botanical, technological and artistic! Ueno harvests the bamboo trunks by hand at the end of the year, then coats them in oil and dries them outside for two months. With the arrival of spring, it is time for the arduous process of striping the outer surface, then slicing the pole into strips of perfectly equal size and thickness. As a former architect, Ueno is able to combine these ancient techniques with state-of-the-art computer-aided design to play with the possibilities of form and structure. But when it comes to the weaving of the final creation, Ueno must rely on his own nimble fingers and agile imagination. Find out more about Ueno’s bamboo craft at bamboouenomasao.com. Metal seems as malleable as clay in the hands of sculpture artist Satoshi Mizushiro. Combining skillfully shaped metals bars with subtle gradations of colour, Mizushiro coaxes out gloriously lifelike models of animals and plants. This smoothly curved flying fish looks ready to leap back into the ocean at any minute. See more of Mizushiro’s creations at satoshimizushiro.com. This one-of-kind piece entitled 'Silver Poetry; Spring Fever Ring' is an appropriate introduction to Mori’s instinctive making process: ‘No piece is individually planned but becomes fully formed within the making and thinking process. Repeating little accidents, like a mutation of cells, the final accumulation of units emerges within this process of evolution,’ says Mori. See more of Mori’s exquisite work visit junkomori.com. Motohiko Odani is one of those artists who are propelling Japanese sculpture into the future. His work expresses the unlimited potential of sculpture: s a 3D medium, it does not have to be static and observed, it can be dynamic and interactive. Odani always brings this out in his sculpture. 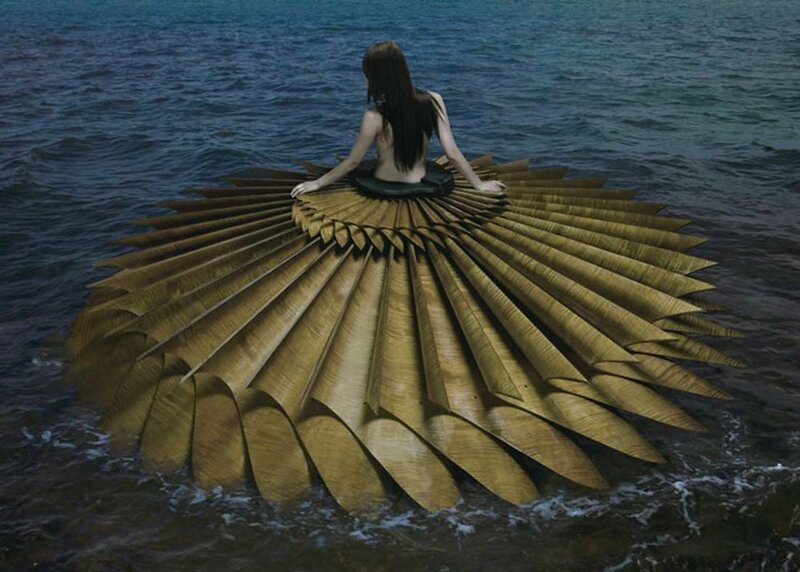 This wooden ruffle dress is a great example as it appears to spin against the waves, even when it is standing still. The blurring of sculpture, art, fashion and photography is the inspirational result of Odani’s singular vision. Enjoy more of Odani’s work at phantom-limb.com. Which sculptors do you think we should add to this list? Let us know in the comments below!